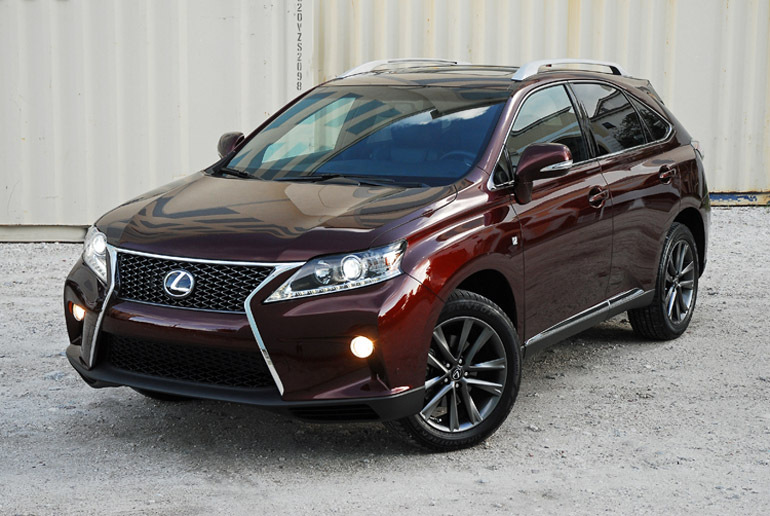 The Lexus RX 350 is the #1 selling mid-size luxury sport utility vehicle. It is about time that Lexus brings to its many enthusiasts a RX with higher levels of performance and sharper exterior styling with interior sporty cues. The new F SPORT is available only in all-wheel drive and features an eight-speed automatic transmission with razor-sharp responding paddle shifters, an F SPORT-tuned suspension to keep the exclusive 19X8 inch split five-spoke wheels in a Dark Graphic finish solidly planted on the ground. In the front are an aggressive front bumper, HID headlamp clusters, and a deep mesh grille with the new signature chrome spindle design. Down below is a splitter and foglamps at the sides. Inside are a host of exclusive sporty cues making it even more fun to be piloting the new RX 350 F SPORT. The new RX 350 F SPORT combines the standard 3.5 liter, DOHC, 24-valve, all-alloy V6 engine that generates 270hp at 6,200rpm and 248lb.ft. of torque at 4,700rpm. Dual Variable Valve Timing with intelligence (VVT-i) is used to control both intake and exhaust camshafts independently; optimizing engine performance at many speeds and loads. I would have liked to see a significantly increase in horsepower to really make the F SPORT go faster off the line. 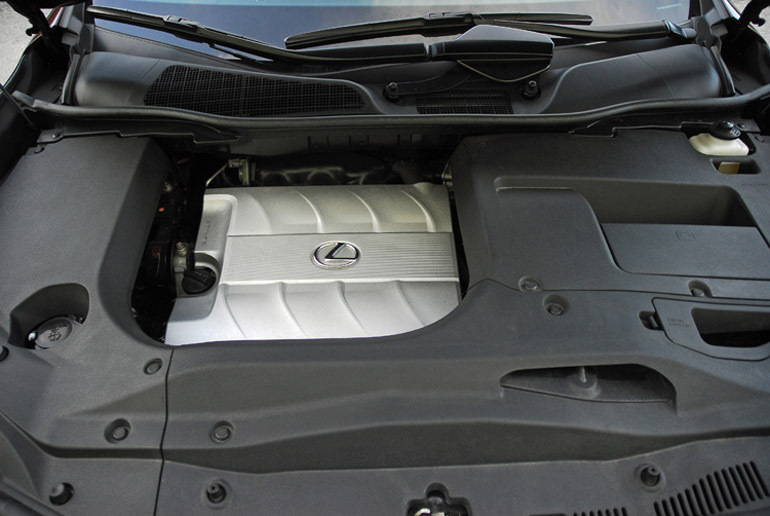 It only got to 60mph from a standstill in just under 7 seconds, which is about the same for the regular RX 350. 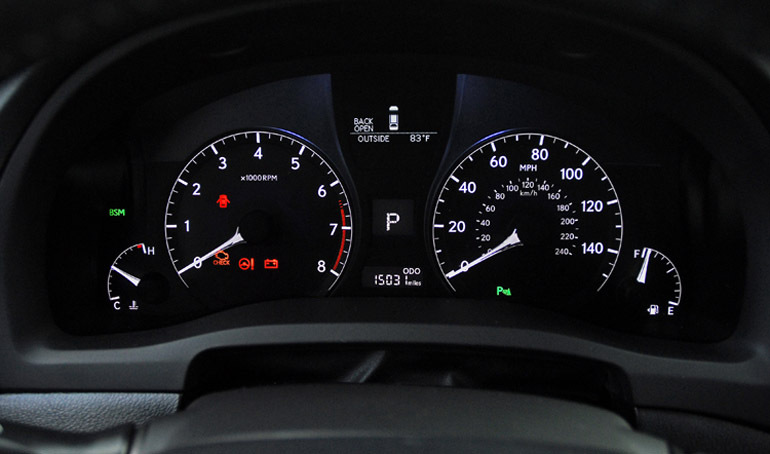 The RX SPORT’s eight-speed automatic is only available in the new F SPORT and comes with fun-to-use paddle shifters. It gave me quicker shifting response with help from miniature high-flow linear solenoids that allowed for more precise clutch operation. The torque converter uses a low-speed lockup damper to enable lock-up from first to eighth gear to help fuel economy. All of the torque is transferred to all four wheels with an electronically controlled Active Torque Control AWD system. Active Torque Control AWD uses an electronically controlled coupling ahead of the rear differential to vary torque distribution anywhere from 100:0 to 50:50 front to rear, depending on driving dynamics and road conditions. When accelerating, or at launch on a low-grip surface, torque is quickly provided to all four wheels. At steady speeds, torque is sent to the front wheels, enhancing fuel efficiency. The new F SPORT gets 18mpg/city and 26mpg/highway. The fully independent suspension gets tuned for more aggressive driving. The tuned MacPherson strut front setup includes coil springs, an anti-roll bar and monotube shocks. The rear setup is a double-wishbone setup with coil springs, anti-roll bar and monotube shocks. The firmer shocks and springs gave me a more engaging driving experience. A unique lateral performance damper system absorbs and minimizes body vibrations, resulting in a more linear steering feel from the electric power-assisted rack & pinion system and enhanced ride comfort. It responded to my inputs quickly with no wavering. In lieu of conventional fixed bracing, no front strut tower brace, this system features a front performance damper and a rear damper connecting the left and right sides of the rear structural frame. VDIM handling technology is standard on the RX 350 AWD F SPORT and has been recalibrated for the more aggressive handling F SPORT. VDIM anticipates loss of vehicle control and governs all of the vehicle’s dynamic handling systems-the ABS Braking System, BA, EBD, Vehicle Stability Control and Traction Control-with the electronic throttle control system. The system employs them collectively and seamlessly to help make corrections while allowing high dynamic capability for more aggressive driving on curving roads. 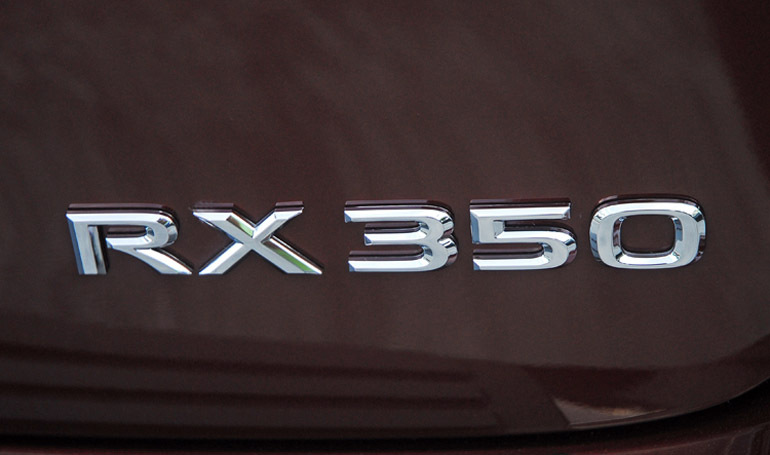 Slowing the new RX 350 F SPORT down from speed are large, four-wheel power-assisted steel disc brakes. Up front are 12.9 inch vented discs clamped with dual-piston calipers and 12.2 inch solid discs clamped with single-piston calipers in the rear. Adding to the more aggressive handling prowess are the meaty Dunlop 235/55VR19 inch Grand Trek Touring A/S performance tires. The wrap around aggressive 19X7.5 inch split-five spoke Dark Graphite finished alloy wheels. 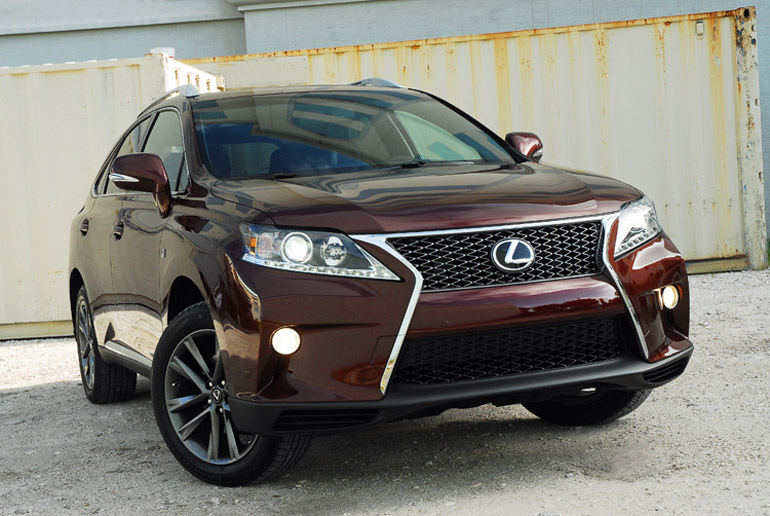 The new exterior styling shows that this RX 350 F SPORT is more aggressive on the road. The new distinctive and contemporary front fascia is highlighted with Lexus’ signature chrome spindle grille and a bolder sport bumper, featuring an F SPORT exclusive mesh grille. The upper edge of the grille is set lower than the upper edge of the HID headlight assembly to establish a more aggressive look. Standard LED daytime running lights and combination rear LED lamps reflect the ‘L’ design motif. Foglamps are integrated into the sculpted lower front bumper fascia that also includes a centered splitter. Pronounced front fenders flow into the doors, and integrated rear fender flares neatly sweep around to pull together the taut rear corners of the vehicle. The lower bodykit emphasizes the standard 19 inch wheels and tires. 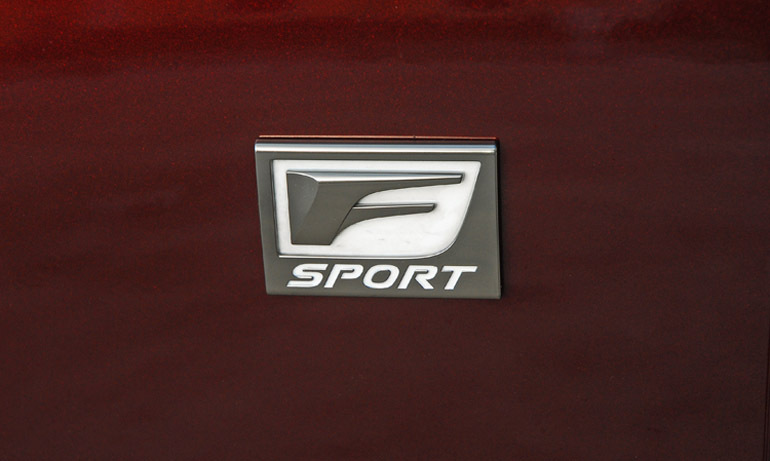 Distinctive F SPORT exterior badges are seen on the top of the front fenders. The profile shows steeply raked windshield A-pillars, a full perimeter chrome strip around the greenhouse, a chrome strip below the doors, aero-styled heated/self-dimming/power-folding rearview mirrors, pull-out door handles and an aluminum roof rack. 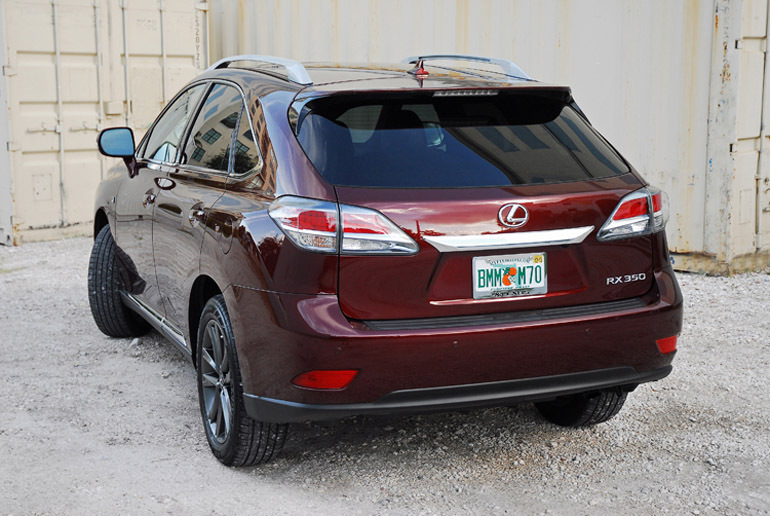 The rear fascia features a spoiler on top of the power opening/closing liftgate, a step-up bumper with a rubber pad. Down below is a diffuser to help better manage the airflow out the rear underside. There is one exhaust tip hidden under the bumper to give it a cleaner look but I would have liked to see dual exhaust pipes spaced at each end for a more aggressive look from behind. 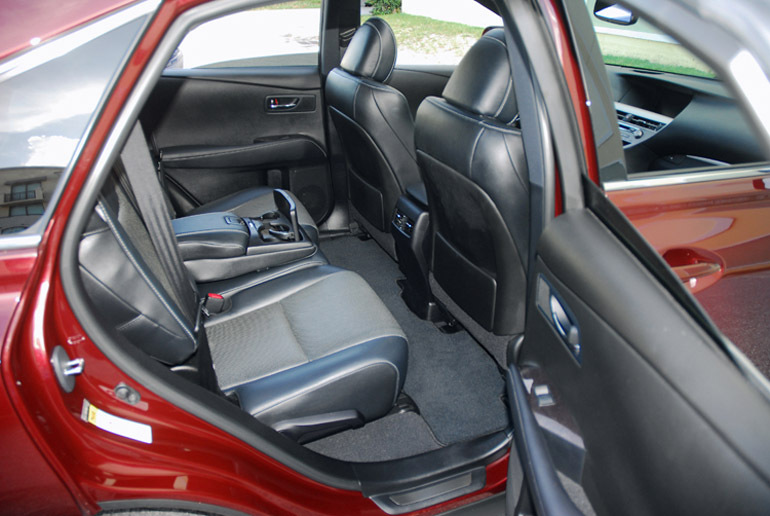 The interior combines the regular RX 350 luxury and convenience features with the F SPORT exclusive cues. These include perforated black leather-trimmed, 10-way powered front bucket seats that are very comfortable and supportive with white perforation holes. White contrast stitching accentuates the seats, center console with dual cupholders/storage bin/armrest, and door armrest. A new Ebony Bird’s eye Maple trim is found on the center console and switch plates thus adding a touch of sporty elegance. A black headliner, sporty perforated leather-wrapped/power tilt/telescopic steering wheel feels great in my hands and shows the ‘F’ logo on the bottom. There is also aluminum pedals with rubber inserts to finish the sporty interior character. The new RX F SPORT can accommodate a variety of music sources, providing auxiliary and USB inputs, Bluetooth audio wireless connectivity and a standard integrated SiriusXM satellite radio receiver. Standard voice recognition and Bluetooth technology allow phone calls to be made and received once paired with a compatible smartphone. When an iPod is attached via the USB port, information such as artist name, track and album can be displayed on the available navigation or headunit, while the iPod can be controlled through the audio system. The large center console storage box easily accommodates a variety of electronic devices while keeping wires out of sight. Standard features not mentioned above in the new RX 350 F SPORT include the Lexus Premium Audio system, automatic sound levelizer with in-dash single feed 8-disc CD auto-changer, USB iPod/MP3 control, Bluetooth technology, XM satellite radio, auto dual zone climate control with air-vents, reclining/sliding 40/20/40 split rear seat with pull down dual cupholder/storage tray, cruise control, power sunroof, heated/ventilated front bucket seats, electroluminescent rallye gauges, Lexus HomeLink Universal transceiver, SmartAccess Passive entry, LCD screen for ventilation, audio settings, multi-media display with Lexus personal settings, trip computer and outside temperature display, all express up/down windows, dual map lamps, grab handles above each door, variable speed wipers/washers, rear hidden wiper/washer, map pockets behind the front seatbacks, rear tonneau cover, floor mats, dual lighted vanity mirrors, and a leather-wrapped stick shifter. 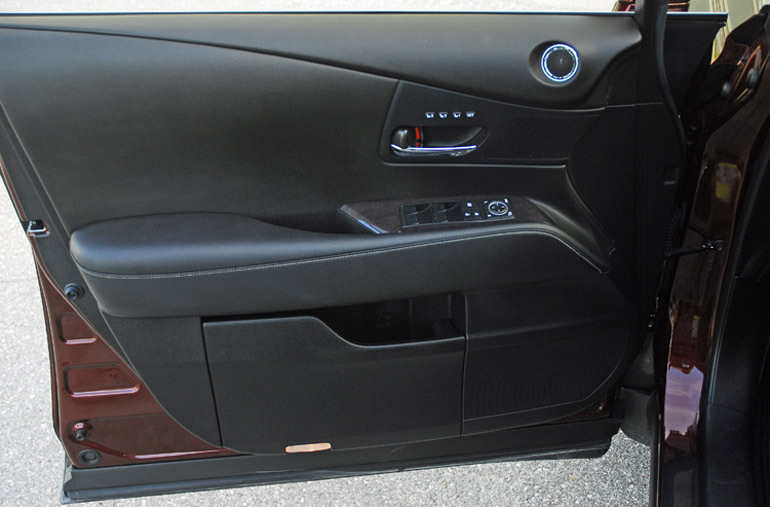 There is storage in each door and in the large, locking glovebox. My new Lexus RX 350 F SPORT came with these options: Blind Spot Monitor, a great Head’s-Up Display, the awesome Mark Levinson Premium Audio Surround Sound system with a single DVD/CD Player, HD radio with iTunes Tagging and 15-speakers, the Lexus Navigation System with Voice Command, Lexus Enform, Lexus Enform screen multi-media display & Lexus Enform with destination assist and eDistination, App Suite, Sirius XM NavTraffic, NavWeather, Stocks, Sports and fuel prices, Intuitive Parking Assist and Cargo net. Standard safety features include dual advanced front airbags, driver/front passenger knee airbags, front & rear side curtain airbags, front & rear seat mounted side airbags, Smart Stop Technology, 3-point safety belts for all five seats with front pretensioners/load limiters, , vehicle theft deterrent system with engine immobilizer, automatic headlights, daytime running lamps, tire pressure monitor and front/rear crumple zones with steel beams in each door. 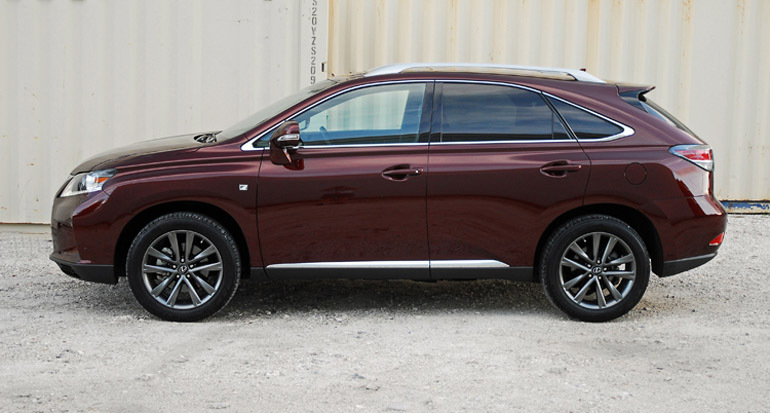 The new 2013 Lexus RX 350 F SPORT is an excellent AWD performance sport utility vehicle that gives the driver more levels of performance in handling when driving on curving roads or straight ahead at high speeds on the highway. It is a good first start to liven up the best-selling luxury sport utility vehicle but I would like to see more power to go along with the excellent handling capabilities. Total interior volume: 139.7 cu.ft.